And for this version I’ve even brought on the booze! That’s right, this Spiked Pear Cider is just as tasty as any hot apple cider and has a splash of bourbon to boot. My kind of cool weather treat! 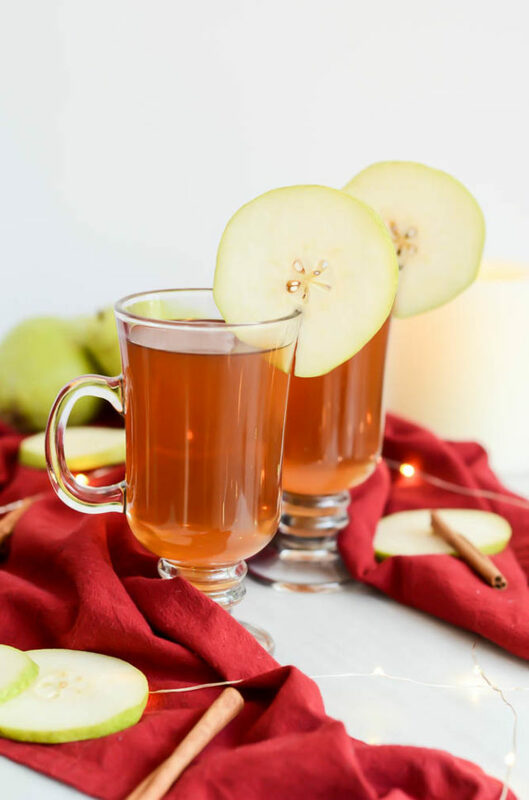 In case you missed it, a little while back I forayed into the world of homemade ciders with this From-Scratch Slow Cooker Spiced Apple Cider and I was more than pleased with how it turned out. It wasn’t too sweet and had just the right amount of spice. It made me start thinking about what other types of homemade ciders I could create, and a pear version was the first thing that popped to my mind. And now that I’m back (at least a tiny bit) in the drinking game, I thought it only appropriate to make my pear cider into somewhat of a hot toddy by adding some tummy-warming bourbon. BUT, if you are not a drinker or not drinking at the moment for any reason (I feel ya) then I’m happy to say that this Spiked Pear Cider tastes just as delicious when it’s just plain ol’ “Pear Cider.” In fact, you don’t even add the booze until the end, so it’s easy to make a batch for a crowd and then just add the booze to the mugs of those who want it. 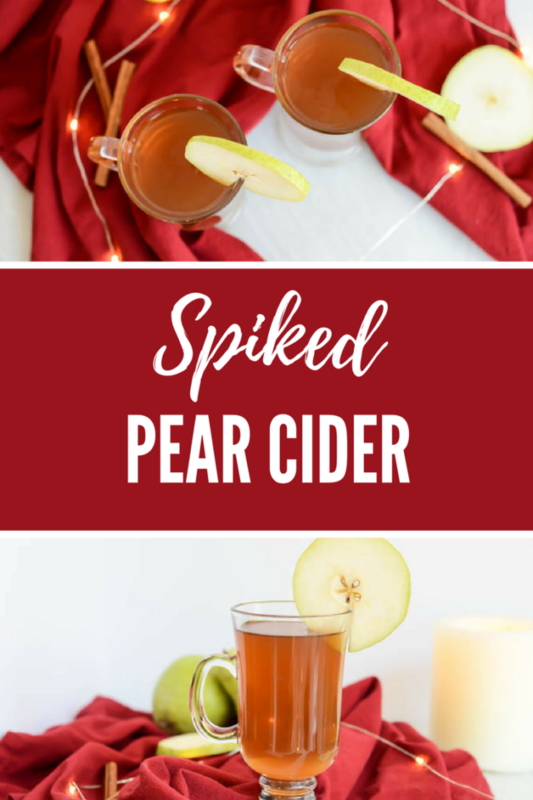 Aside from a little difference in the spices, the directions for making this Spiked Pear Cider are nearly identical to those for the apple cider. And whereas my apple cider recipe had no added sweetener, I did decide to add some honey to the pear cider to help counteract the booze a little bit. Which means it’s that much closer to a legit hot toddy and that much more acceptable to drink if you’re ever feeling a little bit under the weather this winter. Am I right? So what I’ve done here is included the recipe for the pear cider itself – which you’ll make in the slow cooker – and then also the ratios for boozing it up. 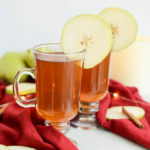 Plan on making the nonalcoholic pear cider in the slow cooker at least one night before you want to drink it (or first thing that morning since it takes 7 hours to cook) and then you can easily just keep it warm in the slow cooker or refrigerate it and reheat it when you’re ready to enjoy it as a cozy adult beverage. 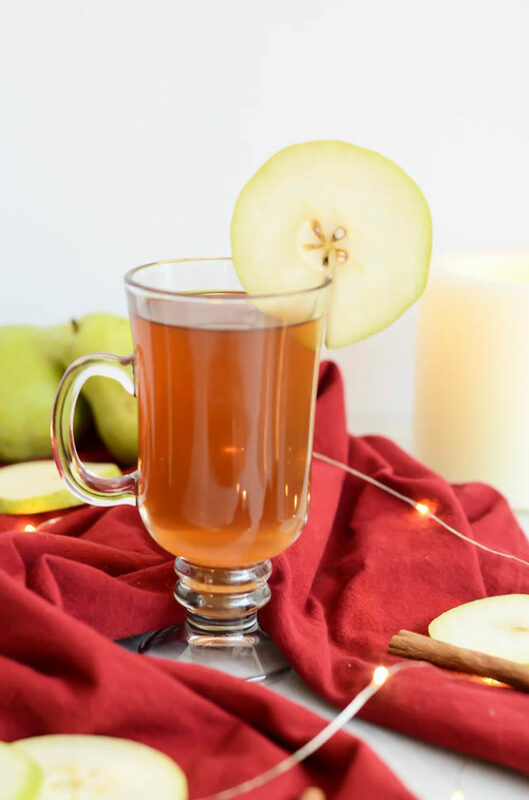 This Spiked Pear Cider is the perfect drink to have on hand for the holidays when you have guests and visitors stopping by at any given moment, or when you’re just looking for a little something special to serve up for family. It’s easy to throw together and can be made suitable for kids and adults alike. Plus, who doesn’t love a great “set it and forget it” recipe for this crazy time of year? 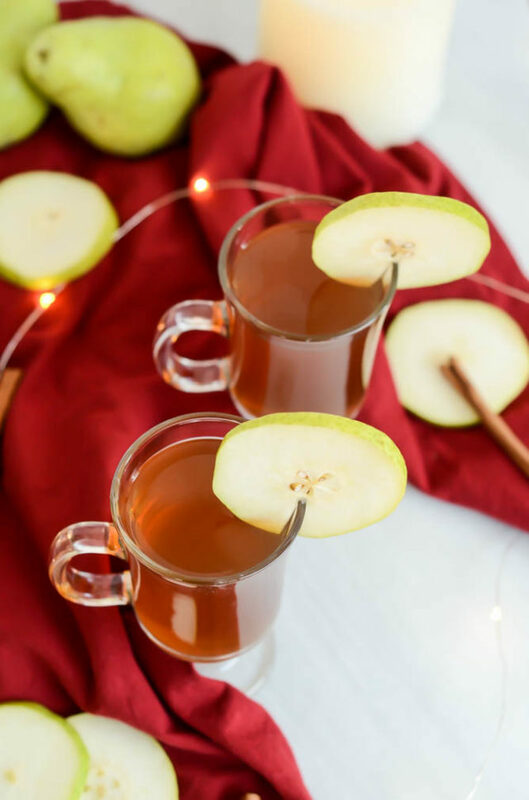 This slow cooker recipe is a fun new take on cider and can easily be made nonalcoholic for the young 'uns or non-drinkers in the crowd. Combine all of the cider ingredients in a slow cooker and cook on low for 7 hours. Strain cider into a pitcher or a few Mason jars and discard solids. To make the cocktail, measure out 2 ounces of bourbon into a mug and add 4-6 ounces of the cider (depending on the size of your mug.) Enjoy warm.